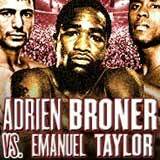 Review: 2014-09-06, nice and close fight between Adrien Broner and Emmanuel Taylor: it gets three stars. Adrien Broner entered this fight with a boxing record of 28-1-0 (22 KOs=78%) and he is ranked as the No.6 light welterweight in the world (currently the #1 in this division is Danny Garcia), he suffered his only defeat in 2013 when he faced Marcos Maidana in a bout valid for the WBA Ww title (=Broner vs Maidana); after that fight he came back to win beating Carlos Molina (=Broner vs Molina). His opponent, Emmanuel Taylor, has a record of 18-2-0 (12 knockouts) and he entered as the No.27 in the same weight class, he has already fought twice in 2014 losing to the undefeated Chris Algieri in February (=Taylor vs Algieri) but then he beat Karim Mayfield in July (=Mayfield vs Taylor). ‘AB’ Broner vs Taylor is valid for the vacant WBA International light welterweight title. Watch the video and rate this fight!